Posted on 27, October 2016 by EuropaWire PR Editors | This entry was posted in Healthcare, Internet & Online, Ireland, Technology and tagged Annette Brüls, Dr. David Rhew, Medtronic, MiniMed Connect, mobile accessory for Android. Bookmark the permalink. The MiniMed Connect mobile accessory, now available for Android devices, is the first product to enable people with diabetes to discreetly and conveniently view their insulin pump and CGM information on a smartphone. DUBLIN, 27-Oct-2016 — /EuropaWire/ — Medtronic plc (NYSE:MDT), the global leader in medical technology, today announced U.S. commercial availability of the Android(TM) operating system version of the MiniMed Connect mobile accessory, the first and only product enabling people with diabetes to see their real-time glucose level on Android mobile devices. The MiniMed Connect app, which was originally launched on iOS in September 2015, helps people with diabetes see how they’re doing right on their phone by providing convenient access to their insulin pump and CGM (continuous glucose monitoring) data in an easy-to-use smartphone application. The MiniMed Connect app also allows care partners to better participate in diabetes care with real-time access to glucose and insulin data on any Internet-connected mobile device or PC and therapy alerts via text message. In addition, the MiniMed Connect app allows healthcare providers to more efficiently access data for therapy optimization through daily uploads of insulin and CGM information into CareLink® therapy management software. 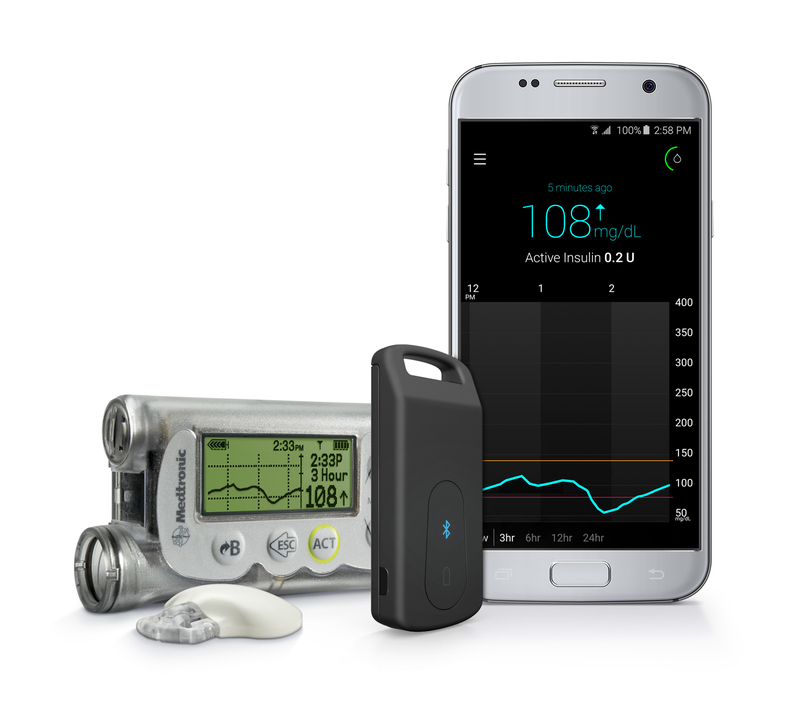 The MiniMed Connect app is compatible with both the MiniMed® 530G system and the MiniMed® Revel(TM) system, providing greater convenience for people with diabetes, greater peace of mind for their care partners, and more convenient access to diabetes data for healthcare teams. People with diabetes can discreetly view their diabetes information on a smartphone application. The MiniMed Connect app allows care partners to view and monitor this diabetes information via CareLink Personal software, delivering preset text notifications to care partners when the person with diabetes experiences sugar levels that go too high or too low or when an alarm on the pump isn’t cleared. With patient permission, and as arranged with their healthcare providers, there can be convenient access to diabetes data in the CareLink reports. The MiniMed Connect app for Android will work on a wide variety of Android devices including Samsung Galaxy S7 and Galaxy S7 Edge which are among best-selling smartphones in the world for 20162. Medtronic’s vision is to transform diabetes care, together for greater freedom and better health. This vision is centered around a deep-rooted belief in delivering solutions so that people with diabetes can live their exceptional lives. The MiniMed Connect app achieves this objective and is also a further demonstration of how Medtronic is moving beyond insulin pumps and CGM devices and integrating leading consumer technologies, data and informatics to enable better therapy decision-making and care. 1 Retrospective analysis of data uploaded to CareLink database for 2,794 patients using the MiniMed Connect device and app for at least 60 days, collected from September 2015 to May 2016. Data is compared to prior 60 days of CareLink data before using MiniMed Connect app. All data based on sensor glucose measurements.